BIG SALE!! FAIRY FIGURINES BIG SALE!! Lush Earth Fairy figurine has delicate green butterfly wings and holds a chatty frog recounting nature's tales. She sits on a glass crystal ball with decorative bubbles. Use as a night light with a color changing LED light base. Hand painted polyresin fairy figurine on bubble glass ball. 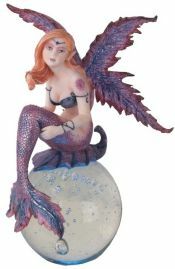 Charming Water Fairy Mermaid figurine has sunny gold sparkle wings and tail and ponders the day over a glass crystal ball with decorative bubbles. Use with a color changing LED light base for added effect. Hand painted polyresin fairy figurine on bubble glass ball. 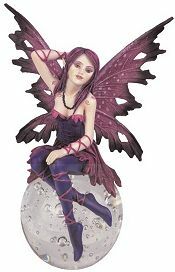 Lovely red haired Mermaid Fairy has a glistening tail and matching purple and lavender hued wings as she rest on a leaf atop a real crystal ball. 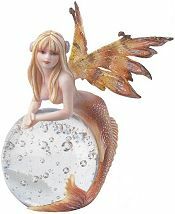 This beautiful hand painted polyresin mermaid figurine on a bubble ball can be a gift that lasts a lifetime. Radiant Flower Fairy figurine in cheerful, sunny hues holds a colorful butterfly as she sits on a Hibiscus bloom atop a glass bubble crystal ball. Add fun with a color changing LED light base. Hand painted polyresin fairy figurine on bubble glass ball. 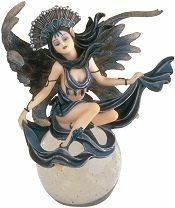 Elemental Wind and Air Fairy Queen figurine commands the invisible powers of the Air. She sits on a glass crystal ball with decorative bubbles. Create a dazzling light show with a color changing LED light base. Hand painted polyresin fairy figurine on bubble glass ball. Playful Masquerade Fairy has a rainbow mask, matching butterfly wings and is headed to the Carnival with a rose garland belt, leather bodice and body paint! 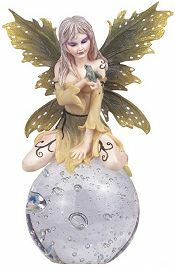 This beautiful hand painted polyresin fairy figurine on a bubble crystal ball can be a gift that creates a fond memory. 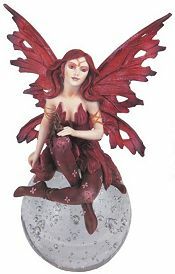 Alluring Autumn Fairy with baby Dragon at her knee is hand painted in a thousand shades of fall hues and sits on a real crystal ball. This beautiful polyresin fairy figurine on a sparkling bubble crystal ball paperweight makes a unique table ornament or centerpiece. Beautiful Purple Fairy has hand painted delicate butterfly wings and purple leather laced leggings. 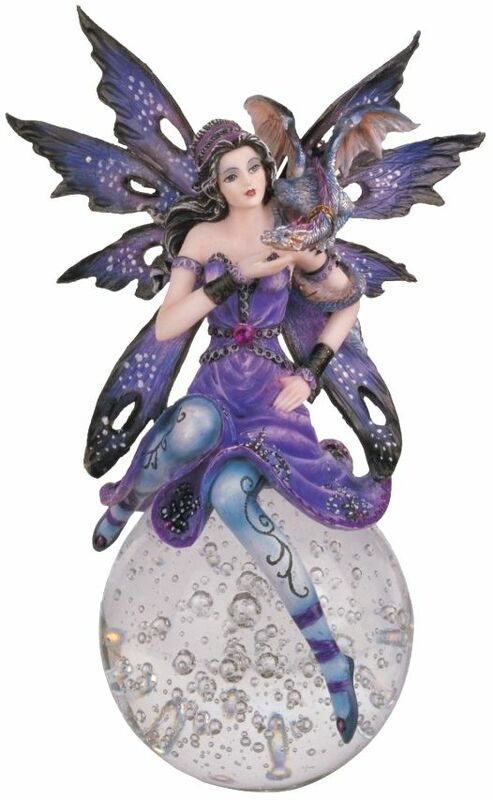 This eye catching polyresin fairy figurine on sparkling bubble crystal ball makes a perfect color coordinated decorative accent. A Mystical Fairy with exquisite purple and blue hued wings lovingly pets the Baby Winged Dragon poised on her shoulder. She has a violet gown adorned with gems, matching armlets and beautiful blue leggings. 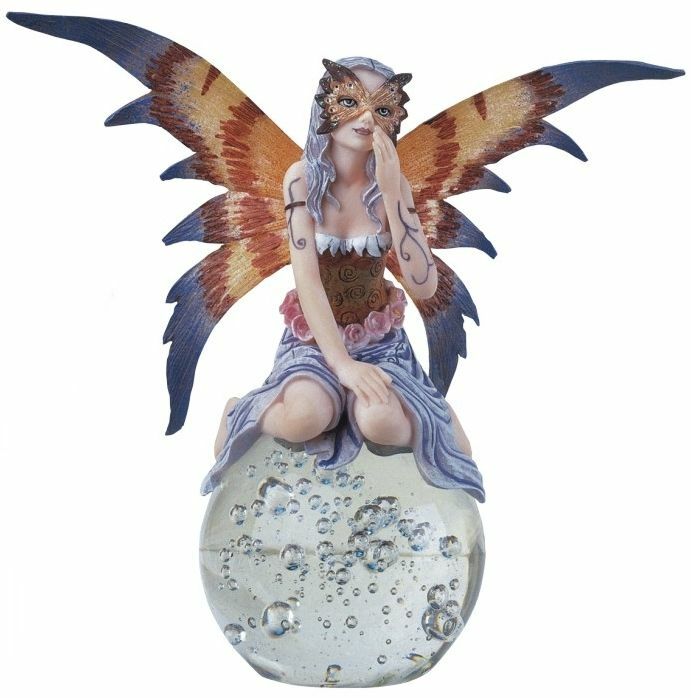 This hand painted polyresin fairy figurine on a sparkling bubble crystal ball makes a unique table ornament or centerpiece. Use with a color changing LED light base for added effect. 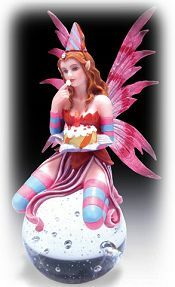 Charming Party Fairy with birthday cake is hand painted in festive pink and blue hues and sits on real crystal ball paperweight with decorative bubbles. This polyresin fairy figurine is set on a sparkling bubble crystal ball and makes a unique birthday party centerpiece. Add pizzazz with a color changing LED light base.